MCM Comic Con London, the UK’s largest pop culture event, is gearing up for its return to the capital this week, on 26-28 October. 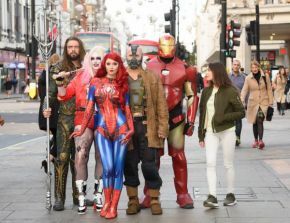 This year’s MCM Comic Con London is packed with bigger guests, exclusive products and more explosive and interactive content, as thousands of cosplayers, movie buffs, comic fans, families, gamers, collectors and anime enthusiasts are set to descend on ExCeL London. Fans can enjoy free panels and exclusive screenings across the whole weekend with cast members, authors and directors; meet top UK influencers in CreatorScape, play the latest games in our GamingZone and compete in or watch the UK Championships of Cosplay. Other guests include the stars of popular Geek &a Sundry web series Critical Role, Matthew Mercer, Marisha Ray, Liam O’Brien, Sam Riegel, Taliesin Jaffe and Brian Foster, who will be going behind the scenes of their epic Dungeons & Dragons role-playing campaigns. Fans can experience some horror with MCM’s spooky guests Tony Todd (Candyman), Kane Hodder (horror icon Jason Voorhees), Katherine Isabelle (Ginger Snaps) and Ray Santiago (Ash vs. Evil Dead). They will also get the chance to meet talented voice actors Charlet Chung (Overwatch), Vic Mignogna (Full Metal Alchemist), Veronica Taylor (Pokémon, Yu-Gi-Oh!) and Zach Callison (Steven Universe). “We are thrilled to open the doors of MCM Comic Con London and play host to the best of pop culture for our fans. We are bringing amazing talent and incredible panels and exclusive content for our fans to enjoy across the weekend,” said Josh Denham, MCM London Event Manager. Comic book legends and Eisner Award-winning comic writers Brian Azzarello and Frank Miller will be meeting fans at MCM London, following their recent collaboration on DC’s best-selling Dark Knight III: The Master Race, a nine-issue second sequel to Miller’s own The Dark Knight Returns. They will be joined by a host of talented comic artists in MCM’s Comic Village, alongside the likes of Chris Claremont and Frank Quitely. As well as meeting guests and checking out the latest art from comic artists, fans can get interactive with some amazing activations and exclusive products on the show floor, from major exhibitors including Nintendo, Square Enix, Hasbro, Cartoon Network, Funko, Universal Pictures, Bandai Namco, Build-A- Bear and Warner Bros.
www.mcmcomiccon.com and MCM Comic Con's social media pages. Additional details about MCM Comic Con events, guests and sponsors will be announced via the website.